This is old version Deck Heroes 10.4.1 apk for Android, you can install it if you want to downgrade or install old app. It is top Casual apps from IGG. If you want to do a free fight, take the Colosseum mode and fight against the opponents of your choice. For more fun, you can also play with your friends all over the world through internet connection. With every match that lasts from 2 to 4 minutes, this game is fast-paced and simple to play. If you are into the graphic, Deck Heroes will definitely live up to your expectation. The beautiful background and card artworks blend perfectly with the environment of the game. For an added bonus, the soundtrack is also surprisingly beautiful and high-quality, although it can be rather repetitive if you play for too long. There are many things you can do every day in Deck Heroes, even if you’re just playing it to kill some time. The gameplay is quiet light and easy to understand, although some players might find it too easy to play. 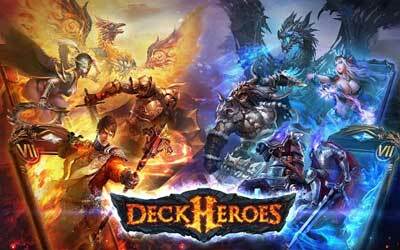 Deck Heroes for Android is indeed a very fun trading card game and definitely one-of-a-kind. Adjusted the amount of Health DMG dealt to both Heroes every round after round 50. Oceanus’ “Clone” no longer affects Octavius. “Sneak” now affects enemies frozen by Freezing Field. Octavius can no longer learn “Sacrifice” through Meld.